Seeing the Dugongs of Bazaruto from your spectacular villa on Bazaruto Island at the luxurious Anantara Bazuruto Island Resort & Spa is one of the most unforgettable experiences of your life! These gracious sea cows are now so endangered that to see one or a few is magical. It all seems so right to see these ocean giants from Indigo Bay where tall palm trees line the dazzling white beaches and an idyllic island resort makes the perfect base from which to enjoy ocean cruises and other water sports. Divers can get up close and personal with Dugongs when they set off to explore the depths of the Bazaruto Archipelago – more than 100 species of coral, hundreds of tropical fish species, dolphins, turtles, sharks and whales. 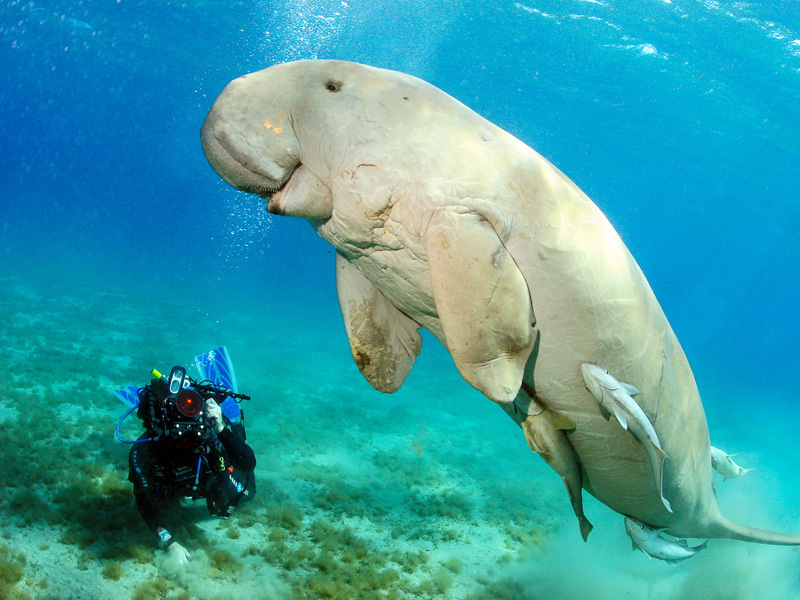 The Dugong tops the list of most divers who seek them out as they graze the seagrasses way below the surface of the ocean. The Dugongs of Bazaruto can get as long as three meters and as heavy as 500kg. They are some of the largest marine animals existing within one of the largest marine reserves in Mozambique, the Bazaruto Archipelago. These dumpy grey mammals spend their days digging up grasses from the ocean floor using their flippers which look like paddles but which also feature five fingers used for swimming and digging. Commonly known as the sea pig or sea camel, the name Dugong actually comes from the Malay term “duyung” which means Lady of the Sea. They move slowly and elegantly, like large ladies – and they swim beautifully thanks to their buoyant bodies and streamlined shapes – it is quite possible that sailors of yore mistook Dugongs for mermaids and this is how legends about mermaids first started – with sightings of Dugongs going about their peaceful existence! Dugongs like shallow warm ocean waters where seagrasses grow thick and where they remain safe from large waves and storms. They do breathe with lungs so have to surface for air often as they cannot hold their breath for as long as whales, dolphins and porpoises. They never go on land and like to hang around in large herds. Dugongs in the Bazaruto Archipelago remain endangered and are mostly seen in small groups of up to three animals. Females only have one baby every three to seven years which contributes to their rareness. Dugongs can live up to 70 years! In Mozambique, they are a protected species and conservation organizations are trying to raise awareness about them. They have been hunted for food and caught in fishing nets. So you can book an ocean cruise at Indigo Bay and set off on a mission to find your Dugong of Bazaruto. It will the sighting of a lifetime for sure so take time to snap some pictures and watch them as they graze. 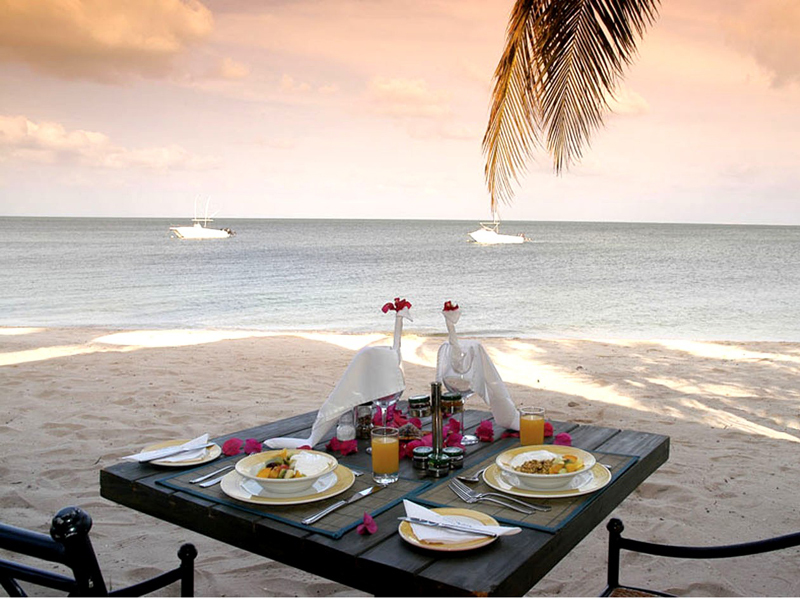 Talk about them over a dinner of fresh seafood as you watch the sunset on another stunning Indigo Bay day. Book your trip with the travel experts today. 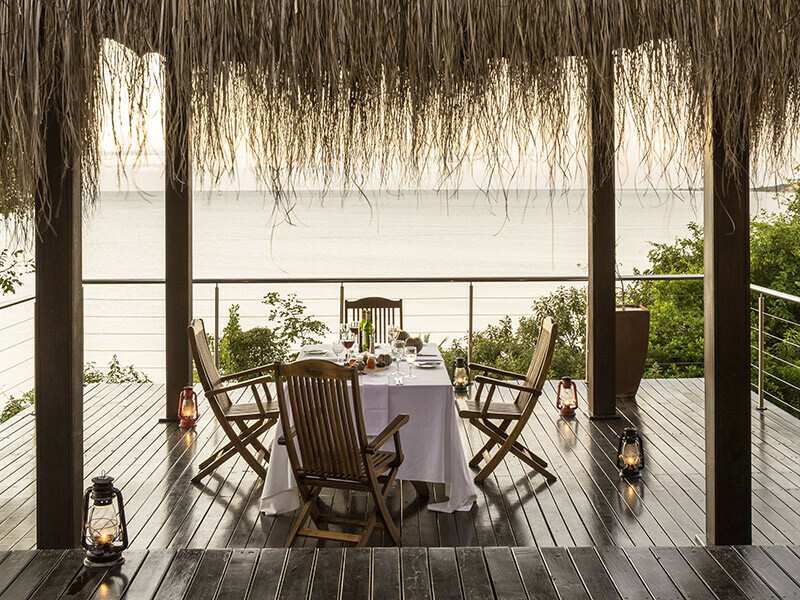 Have you booked Mozambique resorts this year for a once-in-a-lifetime holiday? In that case, you need to make sure you include a visit to Bazaruto Island just off the coast of this particularly beautiful part of the world. Here, you’ll find some of the most stunning beaches, gorgeous tropical climates, delightful scenery and some of the best fishing and scuba diving opportunities to be found anywhere. But in particular, you’ll find the quiet town of Vilankulos, an absolutely idyllic place to truly get away from it all. You can spend your days lounging on the beach or splashing about in the azure blue waters, or you can be more active and fill your travel itinerary full to bursting with all the many different activities you’ll find on offer here. 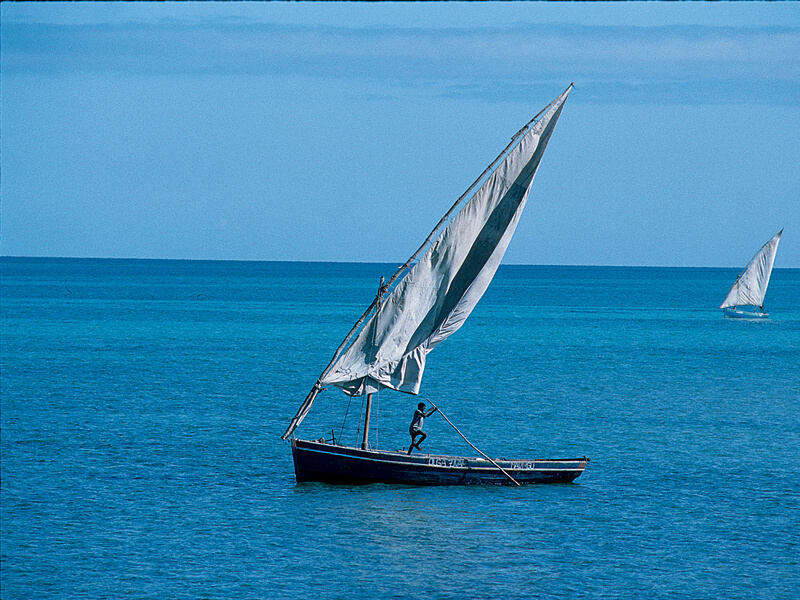 For example, you could enjoy a Mozambique horse safari, or head out on a dhow at sunset. There are many canoe trails to be explored and south-east Africa safaris as well. And, of course, water sports are a must in the part of the world so don’t go home until you’ve tried out parasailing, windsurfing and more. If that’s not what you’re looking for from your Mozambique holiday, then what about making your way to Machilla Magic, a shop and art gallery in town that only features handcrafted items to support artisan makers from the surrounding villages. Certainly, you’re spoiled for choice with a trip to this part of Mozambique so even if you’re staying on the mainland, do pop over for a day. We guarantee you’ll be back! If you are looking for a great location for family holidays and honeymoons, then you should consider Mozambique. Exotic and beautiful, with a prime location on the south east coast of Africa, this country is a treasure trove of holiday opportunities. You are spoilt for choice with so many exciting destinations to choose from, but if you are looking for the ultimate beach experience, then Bazaruto Island, the largest of the five islands in the Bazaruto , comes highly recommended. 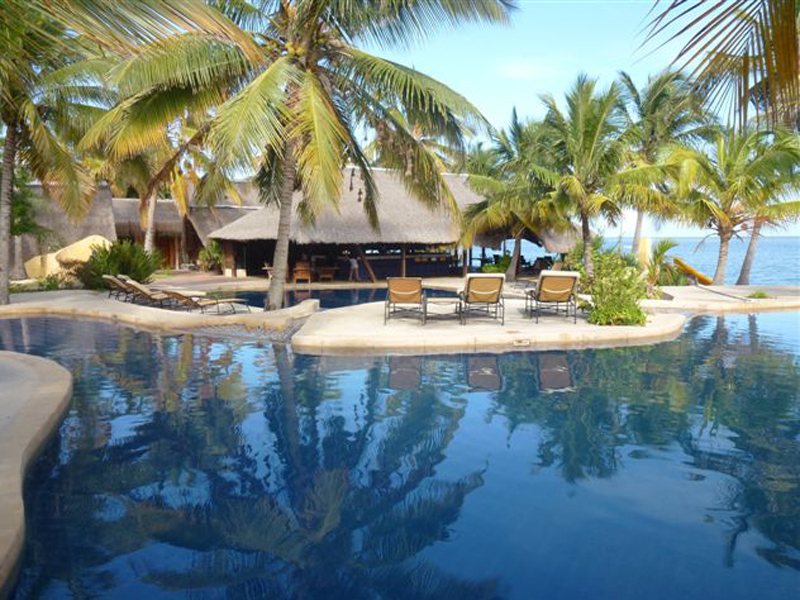 As leading experts in holiday packages to Mozambique, we have access to all the fine beach resorts, lodges and hotels in the country, and Bazaruto Island is no exception. Let us help you plan your holiday of a lifetime and we will give you access to fantastic rates and prices on all your holidays to this little slice of paradise. Spend your days of leisure sprawled on pristine soft sandy beaches, absorbing the sun and enjoying the soporific ambience of island life or head out into the warm turquoise waters of the Indian Ocean to explore the rich corals and discover the aquatic creatures that are found there. You too can experience this with our Bazaruto island holiday packages and special offers that offer great value for your money. The island is host to some of the finest beach resorts in the country and if you choose Anantara Bazaruto for your family vacation, then you’ve chosen well. With 44 aesthetically furnished villas ranging from Beach Villas to the more sumptuous Anantara Pool Villa, different kinds of budgets are well catered for. There is a wonderful kids’ club that offers some fun activities for children, allowing you to make the most of your holiday. For a more affordable option, Pestana Bazaruto Lodge is for you. This luxury Mozambique holiday accommodation has a superb setting on the beachfront and offers great facilities for the discerning guests. Whether you are looking for travel package deals that offer a mix of island life and mainland city dwelling, or perhaps a bush and beach experience, we will find you the right itinerary of your dreams. We have been in the business of selling Mozambique holidays for 20 years and know which places to go to get the best experience possible. And at Bazaruto Island, you will be spoilt for choice with the myriad of activities you can get up to. Because it is situated within the Bazaruto Marine National Park, the largest marine park in Africa, and one of the most significant in the world, you can expect phenomenal diving and snorkelling. This region is renowned for its pristine coral reefs and an eclectic marine species, including the rare and fascinating dugong. So book this top Mozambique island holiday destination with the experts for massive savings on accommodation. Our team of friendly consultants have travelled to Bazaruto Island and have a whole stack of ideas and options for your holiday needs. They will also help you tailor your packages according to your specific requirements. Call us to make your bookings today. It’s a seashore that stretches an amazing 2000+ kilometers and almost all of that is blissful beaches, swaying palm trees and bright turquoise-baby blue bays. This is Mozambique at its best and we are here to show you how to holiday like a champion along the coastline. You can choose to live like royalty in a five-star hotel with much entertainment and bright lights, or rather to kick off your shoes and live more naturally in a rustic eco-lodge hidden in the sand dune forests. You can also choose to set off on a boat or a plane into the Indian Ocean to find an island to hide away on. Whatever your pleasure in Mozambique, you simply have to visit the Bazaruto Archipelago and 5 islands in the sun. Then the remote northern isles of the Quirimbas Archipelago which still offer soulful experiences lost in time. Yet you still find some of the best scuba diving in the world here, firstly off the port of Vilanculos and secondly off the harbor of Pemba. And these gateway towns are also lively tourist bases from which to launch your island explorations. Traveling to the Bazaruto Archipelago is about excellent accommodation, warm water, fantastic fresh seafood and service from local islanders, not forgetting romance on endless white beaches. Try the scintillating Anantara Bazaruto Island Resort and Spa for five-star luxury right on the sands on Bazaruto, the largest island. Find more than enough outdoor entertainment and several restaurants for real local tastes and fresh seafood. Pack nouvelle cuisine picnics on island hopping boat rides to see the other 4 atolls in this ‘Pearl of the Indian Ocean’ – Benguerra, Magaruque, Santa Carolina and Bangue Islands. The Quirimbas Archipelago is one small destination in the world where there are no cars, no roads, few hotels, and therefore few tourists. So if you are looking for a very special African destination and romantic holiday venue, the Quirimbas Archipelago is it. You will remember this forever – the excellent weather and clear blue ocean all around the island hotel of your choice. Perfect for swimming and enjoying a sundowner cruise on a dhow with drinks and snacks – magical! Relax in beach bars after a long day in the sun. 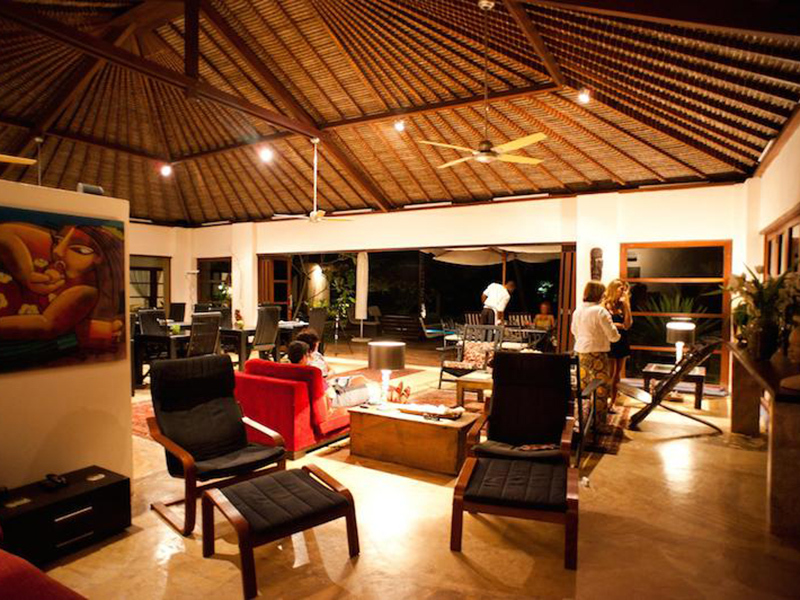 If you choose Ibo Island Lodge, you will be inundated with a charming cultural and historical aura. And you will stay in ancient buildings and visit sites ringing with the sounds of 600-year-old history. You will be pampered with great food and vistas, gardens and walks. Best of all, you will find coral reefs under the sea to write home about and tidal sand bars on which to have breakfast of a lifetime. Not far away lies picturesque Medjumbe Island, a diver’s delight and a honeymooner’s dream. The exclusive Anantara Medjumbe Island Resort & Spa is luxury and hands-on service at its best, also offering one of the best dive centers in the Quirimbas, for those who want to see the magical underwater world around the island. Only 45 minutes from Pemba, this island is easily accessed by light plane. Being only one kilometer long and five hundred meters wide, the island is ideal for romance. One of the best places to stay is Chuiba Bay Lodge, only seven kilometers from Pemba town, the gateway to the Quirimbas. Book one of their six eco bungalows with spacious bedrooms and lounges, en-suite bathrooms, super patios, air-conditioning, satellite TV, personal bar and wireless internet. Beautiful reed touches and earthy decor blends with the environment outside. Spend time in the natural Jacuzzi and Talassa Spa or swim in the two pools. A top class gym also ensures exercise and relaxation come first. Start with the two Azura resorts, one in the Bazaruto Archipelago down south and one in the Quirimbas Archipelago up north. Azura Benguerra Island Lodge beckons visitors to stay on Benguerra Island, the second largest in the Bazaruto Archipelago, to kick off their shoes and revel in real luxury. For less than R30 000 you can stay for 5 nights at Azura Lodge in a beach villa and enjoy all meals including beach dinners, soft drinks and teas and coffees. Your inclusive package deal includes your flight return VIlanculos-Johannesburg, your exciting helicopter flip from Vilanculos to Benguerra Island return, a sunset cocktail daily, a 15-minute back and neck massage, Wi-Fi access in public areas and your Mozambican butler for your entire holiday. Enjoy your own swimming pool, bar, TV, kitchen, en-suite bedrooms and outside shower. Walk straight onto the beach when the sun rises for a wake up swim! Boat trips to remote white islands where guests are treated to picnics under canopies complete with tables and chairs add to this extraordinarily excellent Mozambique holiday. Excellent fishing and snorkelling as well as scuba diving trips stun visitors with their revelations of game fish, dolphins, coral reefs and clear blue seas. A hop and a jump away to the north lie the scattered island of the Quirimbas Archipelago and you need to experience the sister island, Azura Quilalea Private Island. Your 5-night package to this floating blue, green and white isle starts at less than R38 000 per person sharing and includes your return flights, return helicopter transfers and accommodation in a blissful Kazkazi sea facing villa. You also get all meals including beach dinners, soft drinks and teas and coffees, as much snorkelling as you can handle, kayaking, Baobab walks, your daily sunset cocktail and your Mozambican butler. What more could you ask for? One memorable feature is the beautiful coral reef lying at the edge of the sunset villas, directly off main beach. Pure day and night snorkelling overdose, considering that the whole area around the island is protected by a marine sanctuary! Another amazing feature is the food, the glorious food. Be surprised by lovely new venues for each meal – sometimes eat dinner on the beach with candles and other times under the ancient Baobab trees. Feel like you have the island to yourself. There are other things worth mentioning that make your Mozambique holidays excellent in the future, 2016 to 2017. Choose an adventure by dhow and luxury yacht and go island hopping for days in the Quirimbas, leaving land behind for a while. Starting and ending at Ibo Island Lodge, the only island hotel to offer tailor made Mozambique Dhow Safaris into the Quirimbas Archipelago. Go for the standard recommended minimum itinerary of four nights island hopping by dhow or kayak and three nights at Ibo Island Lodge – but you are free to tailor make your perfect adventure! It is all about snorkelling off deserted white sandbanks into clear blue seas then camping overnight on secluded Quirimbas beaches eating fresh seafood on the fire. You may come across indigenous fishermen drying their sardines on the sands. You may come across whales frolicking in the lake-like ocean and you may come across turtles digging out a sandy nest. For something more vibrant and with a sprinkling of night life thrown in, stay in Maputo for a few nights. This thriving capital city of Mozambique is a unique blend of the old and the new, Portuguese and Arab influences whisked with a bit of European chic and African spices. Most of the accommodation in Maputo is good quality – be it simple or fancy – for business and leisure travellers. The world class Polana Serena Hotel offers more for your money. On a similar level, try the Rovuma, the VIP Grand, Cardoso and Tivoli. These stunning high rise hotels offer the best of the best in accommodation in Maputo. Finding the perfect beach break in Mozambique can be quite tricky because there is so much choice! From the capital city, Maputo, to the remotest island in the Quirimbas Archipelago, there are stunning beaches offering sumptuous accommodation for everyone. Some beaches are lined with coconut palms with not a soul to be seen, others are a stone’s throw away from popular hotels and restaurants – you need to find the right Mozambique beach for your break. Contact one of our consultants who have been there, done that. Picture a beach where children can play happily and safely – the ideal family annual holiday break. Think Inhambane, the southern coast of Mozambique, where stunning lodges on the beach offer swimming pools, exhilarating water sports and even quad biking for kids. Stay in rustic beach cabins and eat at resort restaurants daily – children will be able to enjoy all kinds of games in the evenings with new-found friends. A Mozambique beach break is also about getting back in tune with nature – so seek accommodation in the Bazaruto and Quirimbas Archipelagos. Bazaruto, Benguerra and Magaruque Islands in the Bazaruto Archipelago offer luxurious villas and nouvelle cuisine, horse rides on the beaches and romantic picnic dinners for two. Go out on ocean safaris to find the rare dugong and whale sharks which lurk here. Further north in the Quirimbas, fishing and deep sea diving make beach holidays extra special. Book a diving special package on Vamizi, Medjumbe or Quilalea Islands and you will never forget your Mozambique holiday break. See the whales, diving dolphins and sharks. Whatever happens, Mozambique beaches are brimming with enchantment and tranquillity – everything that traveller’s need, who want to get away from it all. Driving as far afield as Tofo and Nacala will introduce travellers to charismatic beach lodges and guest houses with views of the Indian Ocean and a chance to meet other people. And booking a break on a beach with a difference would be a lodge on the shores of Lake Malawi on the Mozambique side – sand and water but a huge lake! There is so much choice in Mozambique when it comes to the ultimate beach break. Unlimited honeymoons suites are situated on white pristine beaches that go on forever and where couples walk hand in hand – idyllic! The mainland, the cities, the islands and inland towards Malawi, there are beach breaks for all shapes and sizes, budgets and needs in Mozambique! Click here to find out more about Maputo beaches. For an exotic holiday in an exclusive place, Pestana Bazaruto Lodge is a great choice. If you’re looking to book a holiday on this fabulous island this has to be one of the most impressive examples of local Mozambique accommodation. As experts in Mozambique travel, we can offer you some of the best-priced package deals for holidays at the lodge, and help you book it quickly and easily. It’s no surprise that this is one of the most popular destinations we deal with, as the facilities and location are simply stunning. The simple fact is that the Bazaruto Archipelago is the most impressive island destination in Mozambique, and its resorts such as Bazaruto Lodge that make it so. What makes Bazaruto Island so special? For a start, you won’t encounter great crowds of tourists here, like you would in Mauritius, for example, as the island remains an exclusive and secluded destination for a holiday. Furthermore, the sheer beauty and tranquillity of Bazaruto Island and its neighbours is quite breathtaking. This is a holiday destination with a difference, one where you will find the luxurious accommodation, fine facilities and superb beaches and more. Why book with us? We are the acknowledged experts on Mozambique travel, and as a result we have access to many superb specials and packages on Bazaruto Lodge breaks. We have been in the business of holidays in Mozambique for twenty years, and we know the country very well indeed. We know the best places to go, and the best ways to get there, and guarantee the lowest prices for our clients, so you don’t need to look around any longer; book with us, and we will make sure you enjoy the holiday of a lifetime in a genuinely exclusive resort. Our team of expert consultants have experienced Bazaruto Lodge themselves, and are more than happy to talk to you about your requirements. We have many different options for Bazaruto Island holidays and can provide a package tailored especially for your requirements. We cater for all budgets and can offer you the very best deal possible, and guarantee that you will enjoy a break without the hustle and bustle found in busier, and similarly priced, destinations in Africa. You know you deserve that dream Bazaruto holiday, so why not get in touch right away? One of our consultants will call you back within a few hours to discuss your Bazaruto Island holiday options, and help you book the holiday of a lifetime. It appears that business is booming in Mozambique and opportunity is ripe for the picking. The African Economies Outlook Report states that economic growth in Africa should be up to 5% by next year despite huge and damaging issues to attend to such as the Ebola crisis, the South African visa laws and uncertain politics in the West. This hopefully means that the country is stable and a great place to risk an investment or two. We all know that Mozambique is the number one holiday destination in Africa with its appeal of pure white beaches, sky-blue ocean and ocean-blue sky. We all love the island escapes which challenge the idyllic advertisements for Mauritius, the Seychelles and Zanzibar – real coconut palms, luxury villas made from reeds, wood, stone and thatch, and awesome water sports waiting for you to make them happen. We all love the zippy vibe of Maputo which comes alive at night – check out the bars and nightclubs if you want to see what the city is really about, or go seafood tasting at some world class restaurants which line the wide streets of the city centre. These are also the features that attract businessmen to Mozambique – who want to find that work-play balance. Mozambique attracts business people to seminars and conferences regarding its environmental resources and rapid development plans. 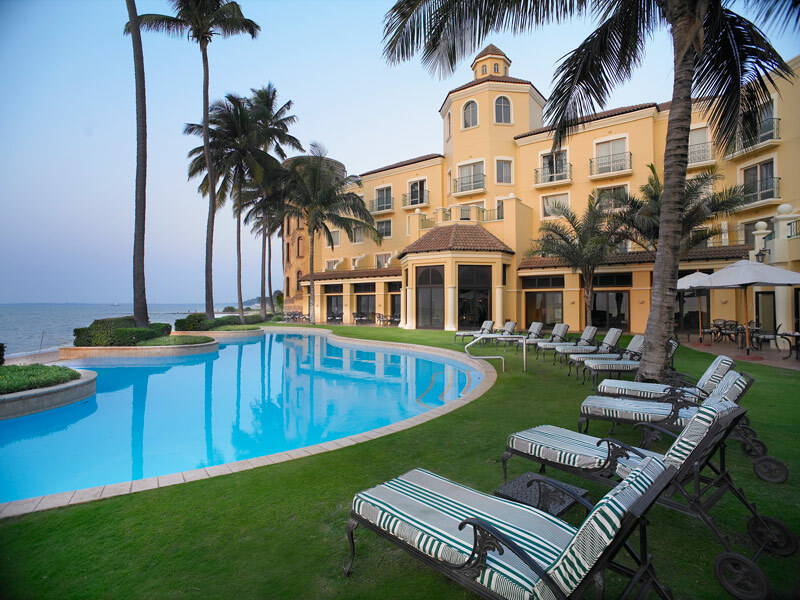 Maputo offers world class hotels and conference facilities that rival some of the best overseas in the first world. Add to this the wildlife, the tropical setting and the friendly people and you have a very attractive business travel destination. Looking further than Maputo, towards destinations like the gateway to the Bazaruto Archipelago, Vilanculos, and to Pemba, the gateway to the Quirimbas Archipelago is wise as there are quality conference facilities in these up and coming towns too. Vilanculos now offers its own conference centre right on the sea and it is ideally situated beside an international airport and harbour town. In fact, the standard of conference venues and facilities in Mozambique is on a par with those of Johannesburg, the only real difference being maybe the language situation where conference delegates are dealing with Portuguese people and therefore may need to be extra clear about their meeting needs before they get there. Conference organisers in Mozambique have become increasingly busy and appreciate clear instructions when they are setting up a meeting venue so that they can adhere to their quality standards and service. This applies to many top hotels in the country too. Conferences in Mozambique are hot right now so read on to find out where to go for your next business meeting or seminar. Take six star business services, audio visual equipment and various seating arrangements and add to this internet access, onsite catering, wheelchair access and easy accessibility and you have a remarkable conference centre in Maputo. Maputo is these days considered to be the conference capital of Mozambique, let alone the capital city, and the Joaquin Chissano International Conference Centre (JCICC) is the gemstone in the cluster of venues you can choose for your seminar. If you book this meeting facility for your company’s conference, you will get the added advantage of great views over Maputo Bay, a great central location and a choice of rooms depending on your group size and needs. The JCICC can take up to 1000 delegates in its Grand Plenary Hall and there are also grand banqueting rooms with glass walls and stunning gardens where events or functions can be arranged! Imagine sipping cocktails after your conference as the city comes alight and the sun sets – Maputo is definitely the top African business city of the day. This developing African country boasts attractive environmental resources to which investors are drawn like bees to a honeypot. Company representatives arrive in Maputo on a regular basis to do business, meeting with others involved in industry and commerce. We provide your group with irresistible sales incentives to get your meeting going in the right direction. The cherry on the top for Vilankulo is the brand new conference centre that is attracting increasing numbers of business delegates to meet and greet and take their businesses forward. 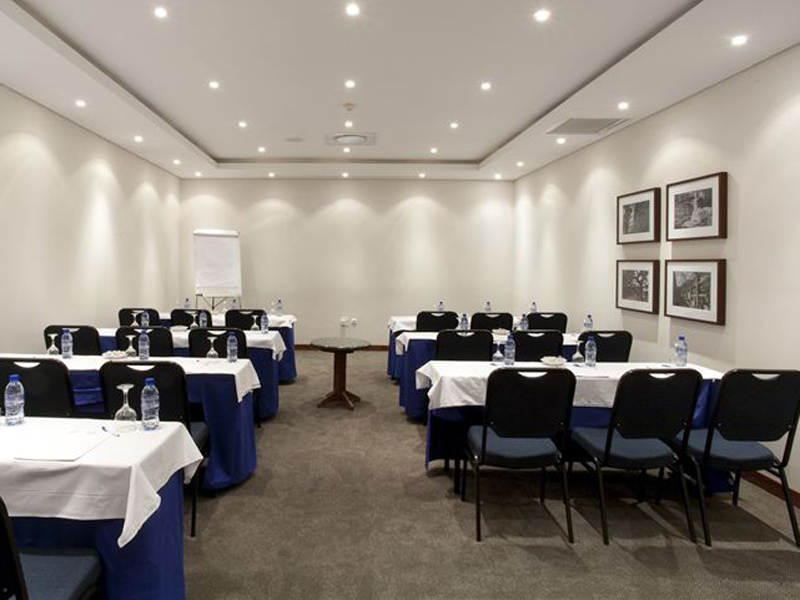 This world class venue can accommodate from 20 to 100 delegates in it small meeting rooms and large conference suites. Air-conditioned amenities include up to date technology and plenty of light – look out over the Indian Ocean, towards the idyllic islands of the Bazaruto Archipelago. Sit back in between meetings to enjoy lunches and teas at the spanking new restaurant and cocktail bar at this new conference destination in Vilankulo. Book into some great accommodation nearby and walk to “work” daily along the sparkling beaches beside the harbour. This meeting facility is also close to the airport and harbour so that conference delegates do not have to feel as if they are wasting time as they travel between their meetings and their transport outlets. The best part about the Vilanculos conference centre is its high tech facilities and first class service. You can arrange your meeting according to a variety of specific layouts using their amazing gadgets to make an impact on your audience. Choose your business getaways for their state of the art conference facilities where business delegates can meet in peace, relax in top gear and see some of the beauty of Mozambique – so choose the Pemba Beach Hotel on Wimbe Beach where the picturesque setting, right on the beach, and rooms looking out into the Quirimbas Archipelago add great value to any conference. The conference venue is modern and well equipped for up to 200 delegates who can use the overhead projector, slide projector, white board, notebook projector and air-conditioned meeting rooms. Corporate clients really appreciate the tea and coffee facilities, bar fridges, and TVs in their rooms, not the mention the swimming pool, health spa, sauna and other world class facilities at this hotel and conference centre in Pemba. The sea offers its fruits in the evenings in the form of fresh crayfish, crab, game fish and calamari. Are you drooling yet for this cuisine and for this standard of conferencing? Pemba is a conference venue where you have to incorporate some play time – close to Niassa Wildlife Reserve, this northern port and airport town is also the centre of kite surfing and swimming in warm waters. Go snorkelling between meetings and sip a cocktail as the sun sets into the azure Indian Ocean. It is true that business travel in Mozambique can be carefully blended with leisure activities – your corporate clients are therefore increasingly attracted to places like Pemba, where they can enjoy the latest business and conferencing facilities and take advantage of great sales incentives. Stay in one of 102 upmarket rooms at the Pemba Beach Hotel & Spa with their en-suite marble bathrooms, tasteful Arabian decor, satellite TV and Persian rugs. 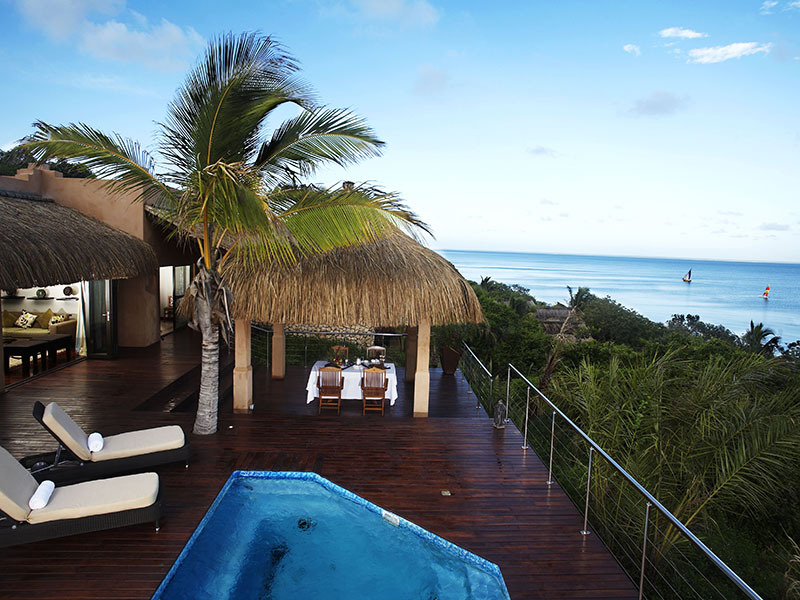 Balconies look out over the sea towards the Quirimbas Archipelago making this your dream Mozambique seminar destination. Business delegates can choose from two bars and a comfortable lounge for drinks and snacks before sampling five star gourmet food. And for leisure times, watersports are in at Pemba Beach Hotel and Spa – windsurfing, knee boarding, wake boarding and sailing are a few of the activities on offer. A walk around Pemba town will reveal traditional markets, fantastic restaurants and bars. A conference that is held at the Maputo Hotel Cardoso is made very easy because it is so close to the airport and the business centre of Maputo – such attractive and statuesque accommodation commands a spectacular view over the bay and sprawling city from its perch on the hill. 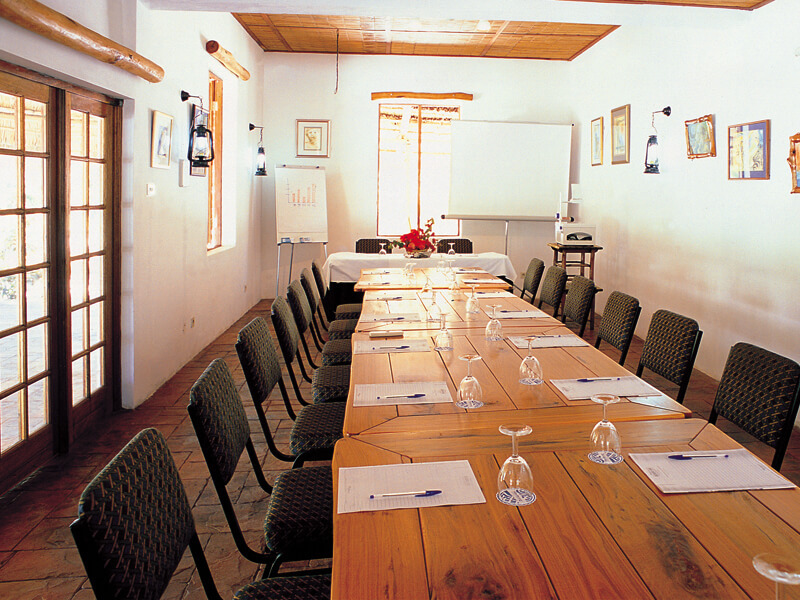 Hotel Cardoso is used to hosting conferences and large functions such as weddings – they have all the necessary equipment and catering facilities for large groups that expect first class service and surroundings. Conference delegates appreciate luxury accommodation in rooms with Wi-Fi, en-suite bathrooms, air-conditioning and views over Maputo. This chic international hotel promises conference delegates the use of five venues for meetings which take different numbers of business guests. There are flip charts and markers, lanterns and laser high lighters, an overhead projector, white board, digital projector, microphones, a great sound system, a remote projection ceiling screen and other business services including secretarial assistance and photocopying. When conference delegates want to relax, they like to do so in style so Hotel Cardoso promises your group banqueting evenings for up to 150 people, cocktail parties for 300 guests and informal dinner for 60 delegates. This is all about convenience, high tech facilities and hands-on attention to detail, not to mention the smiling Mozambican staff who want to ensure that your seminar is successful and complete. Later, take a walk into the city and sample some vibrant night clubs and bars for awesome African and Portuguese entertainment. Team building and group travel are dynamic dimensions to business travel and conferencing in Mozambique – some companies like to add entertainment value to their staff growth sessions, using unique methods to ensure that their business is top of its range and staff are happy. What better destination to try this than the spectacular islands of the Mozambique Bazaruto Archipelago? In particular, the largest island, Bazaruto, offers comfortable accommodation at the accomplished Pestana Bazaruto Lodge, a real home away from home yet a really stylish and world class conference facility too. Develop your team’s special dynamic by booking the luxury chalets right on the beach and trying some new exercises in between meetings. Pestana Bazaruto is earthy and very African in its style and hospitality. Sink into the Mozambique architecture and enjoy 40 A-frame thatched beach bungalows equipped with air-conditioning, en-suite bathrooms with baths and open air showers, private decks and funky wooden furniture. Most business delegates will arrive with little knowledge of the region, and will learn that the Bazaruto archipelago comprises Bazaruto, Benguerra and Magaruque Islands, as well as the smaller Banque and Santa Carolina, (previously known as Paradise Island). This famous National Park protects diverse marine and island species and their ecosystems – including forests, mangroves, rocky shores, grasslands and wetlands. At the Pestana Bazaruto between 25 and 75 conference delegates can meet happily in the meeting room enjoying first class facilities. Delegates can attempt scuba diving and fishing during their breaks, or spend time in the games room playing table tennis, pool and board games. Out to sea, there is pro fishing, snorkeling, island hopping cruises, sundowner cruises and whale watching. So, where will you book your next convention or conference or seminar, meeting or incentive travel trip or team building experience? There is definitely an increase in conferences in Mozambique and business travellers are finding their way not only to the main cities but also to the islands and other remote beach destinations to meet and discuss their corporate issues – with some light relief thrown in such as great wining and dining, fascinating sight-seeing, wonderful outdoor activities related to beaches and ocean and awesome nightly events too. These top 5 venues offer you exciting opportunities for successful conference outcomes and staff bonding. Contact us for more information and we will tailor make your package deal for conferences in Mozambique. Based on what guests say about Indigo Bay and the candid traveler reviews on Trip advisor, it is clear that this exquisite island resort is quite a contender in the hospitality industry in Mozambique (with photos to prove it). An all-rounder holiday destination for families, lone travelers, honeymooners and corporate guests, this hotel on Bazaruto Island will exceed your expectations. Indigo Bay Resort’s perfect combination of excellent service, fantastic cuisine, high-end facilities, and sublime setting have seen it swaggering a Certificate of Excellence from Trip Advisor, a prestigious accolade only bestowed to the well-deserving establishments that take their guests seriously and provide the finest in service and accommodation. With a choice of 5 different room types, you are bound to find one that suits your preferences and budget. There are a total of 44 villas consisting of 29 Beach Villas that are perfect for couples, 12 Deluxe Sea-View Pool Villas with 2 en-suite bedrooms ideal for families, Beach Pool Villa with sunken bath and Jacuzzi, Sea View Villa ideally positioned for intimacy with a private plunge pool as well as the Anantara Pool Villa complete with a private driveway and entrance, 2 bedrooms, elegantly-appointed living room, plunge pool and Jacuzzi. Click here to see the property page. “I have had the good fortune of being a guest at some of the most prestigious beach resorts in the world.Indigo Bay definitely tops the list of my most memorable holidays. The resort setting is unparalleled in beauty whilst being isolated and unspoiled. The accommodation is brilliant and the catering simple but delicious. Nothing is too much trouble for the staff and all guests are made to feel like they are the only person at the resort. All in all, a magnificent resort on a magnificent island.” L. Ram from Johannesburg, South Africa wrote.